Wikimedia Commons has media related to Dachshund. The breed was developed to use its sense of smell to find, chase, and hunt badgers and other animals that live in holes. A dachshund has a long, narrow body, so it is sometimes called a wiener dog, hot dog, or sausage dog. Some people believe that using those words does not show respect. Today, dachshunds have crooked legs, loose skin, and a barrel-like chest. Over time, breeders selected dogs so that those features would appear in puppies. That way, dachshunds could do a better job of burrowing into tight spaces. Another feature is a long tail. The coat or fur of a dachshund comes in three kinds – smooth or short-haired, long-haired, and wire-haired. 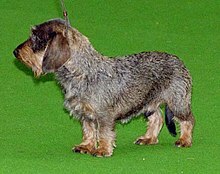 The wire-haired dachshund usually is shorter front to back than the other two. Dachshund fur comes in many colours. The colors that are most common are red (a brown color that looks a little reddish) and black-and-tan (black body with brown parts). There are solid black and solid chocolate-brown dachshunds. Many people think those dachshunds are handsome, but the colors are not standard or official – that is, you cannot enter those dogs in some dog shows. Dachshunds are playful, fun dogs. People know that dachshunds like to chase small animals and birds, and when they chase those animals they do it ferociously (without fear and very intensely). Many dachshunds are strong-headed or stubborn, and that means they can be hard to train. However; if trained in proper way and at an early age, these dogs can be a good family dogs. These dogs should be trained for socialization and obedience. Dachshunds are often very loyal to their owners (devoted to their owners, or very interested in their owners). In fact, they can be much more loyal than other kinds of dogs. But wire-haired dachshunds often do not show that kind of loyalty to their owners. People know that dachshunds have deep and tender eyes, and that dachshunds have many facial expressions (dachshunds can communicate just with the look on their faces). Dachshunds often have spinal problems, that is, their backbone can become injured. That is because of the dog’s very long spinal column and short rib cage. The problems are usually hereditary (genetic), that is, they are passed down from parent dogs to puppies. A dachshund that is obese (fat) can have a higher risk of getting injured. That is because the extra weight puts more strain on the backbone (vertebrae). To prevent injury, dachshunds should not climb stairs or jump unless they really have to. It is also important to hold the dog the right way – by holding up the front and the rear parts of the body at all times. Some people have wondered if dachshunds go back to ancient Egypt. People have found drawings and engravings from ancient Egypt that show hunting dogs with short legs. But the dachshund of today was bred in Europe, and it has parts of German, French, and English hounds and terriers. Kings and queens all over Europe have had dachshunds. Queen Victoria especially liked dachshunds. Dachshund Club of America, Inc. DataBase "Dachshund of the World"
"How to Train a Dachshund"
This page was last changed on 23 September 2018, at 22:07.